A good old fashioned shootin’ match went down at the Bayshore on Wednesday as the Hamilton Bulldogs had the last laugh, taking the first shootout of the 2018-19 season. 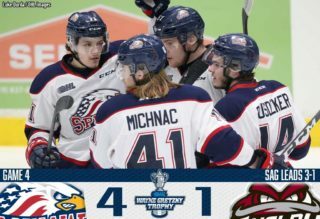 Hamilton’s 7-6 win came behind the first OHL hat-trick from 2019 NHL Draft prospect Arthur Kaliyev (10, 11, 12) while MacKenzie Entwistle (5, 6) had two goals and an assist, Matthew Strome had four assists and Brandon Saigeon picked up three helpers. 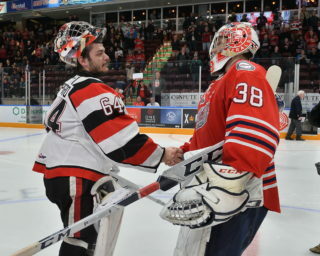 Kade Landry (2) also scored while Saigeon and Strome scored in the shootout and goaltender Nick Donofrio made 41 saves. 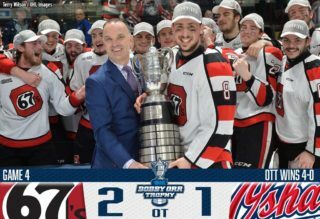 The Attack were powered by a two-goal performance from Nick Suzuki (4, 5) while Kevin Hancock (5) scored the game-tying goal and added three assists. Aidan Dudas (6), Maksim Sushko (1) and Alan Lyszczarczyk (4) also scored for Owen Sound as they outshot Hamilton 47-34 to earn a point. 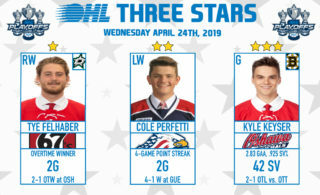 Toronto Maple Leafs prospect Sean Durzi had four assists and finished with a plus-4 rating. The Attack fall to 4-5-0-1 while Hamilton climbs to 7-3-1-0 with a third straight win.